Stylishly decorated 2 bedrooms, 2 bathrooms and a beautiful stone fireplace in the living room. Completely renovated in 2015. Built-in banquette seating in kitchen. Kitchen is stocked with essentials for cooking. Large shady backyard with pergola containing a BBQ and table for outdoor eating. Laundry facilities. One block walk to the lake to watch the sunset. Quiet residential dog-friendly neighborhood. Quality linens provided. Our house is in the country so we have traditionally taken our children trick-or-treating in this quaint neighborhood. It has a wonderful, neighborly, small town feel. The beautiful stone fireplace is the centrepiece of this house and why we purchased it despite the odd floor plan (which we have since corrected). Two full baths. One with shower unit, one with tub/shower combination. Two minute walk to lake with park benches and small beach. Brand new stainless steel fridge. Staples such as coffee, tea, sugar, etc. provided. Open concept kitchen with built-in banquette seating. We had a lovely stay at this nice cottage. The location was perfect. The cottage was the perfect place for our March Break family getaway. It had everything you could ever need including coffee, condiments, dishwasher tablets etc. It was quite spacious and yet still felt cozy at the same time. Decorated beautifully! It was a short walk to the lake, which was great as we also brought our dog. We would definitely go back! Thank you Stephanie for your kind words. We hope to have you again as our guest on your next visit to Niagara on the Lake. Warm, inviting cottage. Well stocked kitchen and comfortable beds. Enjoyed having a fire in the fireplace one evening. Just a short walk to the lake and really enjoyed a walk around the beautiful neighborhood. Peter was quick to answer any questions. Would definitely stay here again if in the area. Lovely, charming and yet spacious cottage! Very enjoyable stay. Mother/Daughter weekend couldn’t have been nicer. Ideal accommodation. Look forward to returning! We loved our stay at Hamlet Cottage. It is located in a charming neighborhood and within walking distance of parks, water, and much more. The house is very clean and comfortable. The beds and linens were of good quality and offered long, peaceful rest. (Just what we needed). We found everything we needed and more to enjoy some meals at “home” while visiting Niagara-On-The-Lake at Hamlet Cottage. Also, our dog Chester, enjoyed his stay at the cottage and in the area. Thank you again, Peter. And if you ever travel through our area, be sure to look us up through HomeAway/VRBO. Our listing is Hard Aground Farm. This was the second time we rented this property and it was great to stay there again. The cottage is well equipped and very comfortable. 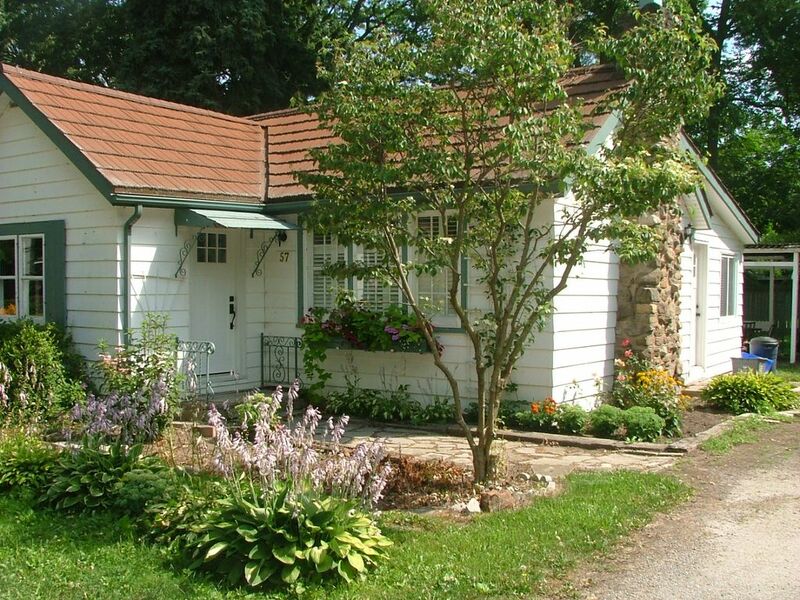 An easy walk into NOTL makes this an excellent place to stay. Thanks Peter! We'll be back. Pet fee $60/ Maximum 2 pets Cancellation policy: Deposit will be refunded if cancellation is made within 30 days of arrival. If less than 30 days notice, the deposit will be refunded only if we are able to rebook the dates.